A frequent criticism of food labelling schemes (incl. the European organic food label and Fairtrade certification) is their cost. For small-scale farmers, the fixed one-time and yearly costs of certification can make the label economically nonsensical to them, even though their mode of production might (perhaps accidentally) conform to what would be certified. And in addition to being expensive, these certification schemes might not be designed to help much. Taking the example of Fairtrade: for regular discount coffee, farm workers get 5.1% of the final sales price as their wage says Wikipedia; for Fairtrade coffee, it is approx. 10% – a generous number claimed here. That’s a 100% increase in wages over “normal” coffee. But that’s not much, given that a 1000% in wages is also possible (for example demonstrated by Blue Mountain Coffee). of the final sales price went to the farm workers. That’s 15 cents per kilogram package of roasted coffee. What they could be paid is 50% of the final sales price when doing not “just” harvesting, but as landowners and small producers also roasting, packaging etc., but not marketing and selling after export. 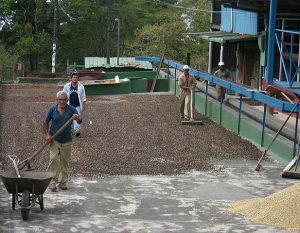 This is what Blue Mountain Coffee claims that their producers are paid. Assuming harvesting work is about half of their work, worth 25% of the final sales price, these farmers are paid a 25% / 0.81% = approx. 31 times the wage of their fellows on Kenya Fairtrade farms … . Let that sink in for a moment: imagine these farm workers unionize and demand a pay raise of 3100%. After the raise, they would make in one year and a half what they made before in a lifetime (of 50 years working the fields). And all that without consumers paying a cent more. The last blank spot for P2P systems? It’s not that we, as consumers, are the greedy ones who demand coffee prices so low that the coffee farm workers picking our coffee cherries are paid such infinitesimal amounts. To the contrary: we buy Fairtrade labelled products to fight unfair North-South trade practices. My question is, why is there no Internet-enabled P2P alternative for that would actually work to ensure high quality, fairly paid food production? Just like the Internet enabled other schemes that decreased the cost of trust, transaction and documentation by orders of magnitude. Think AirBnB, Bitcoin, Wikipedia, eBay, OpenStreetMap etc.. Literally every other area got at least an attempt at solving it in a P2P fashion, but not food production and food trade. At national scale, I admit, there are CSA (community supported agriculture) schemes etc.. At international scale, there is nothing. 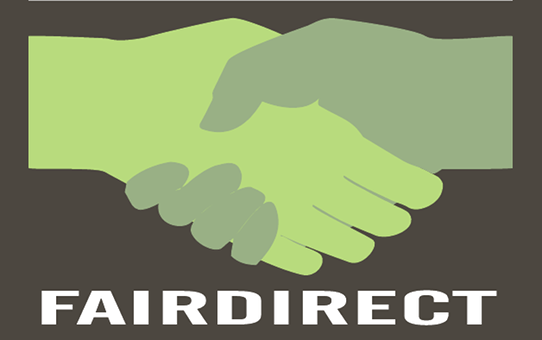 This concept emerged from bouncing ideas back and forth with Micha and his wife (both also Fairdirect members). It’s a rough outline, and everyone’s welcome to add feedback and improvements in the comments. Here is, step by step, how the system would work, according to the proposal so far. Farmers apply. Farmers and food processing companies from all over the world, esp. the smallest in scale of course, register in an online platform their interest to participate in the P2P food monitoring scheme. Food testers apply and take a course. Anyone interested to become “food testers” register their interest as well, and are served an online course “Evaluating food production and food quality”. They have to pass a quiz-style set of questions after each chapter. Make the test appointments. Food testers make appointments with farmers via the online platform, or perhaps there would be regular times for visits or food testers would even be allowed to stop by every time. Food testers visit the farmers. Food testers then visit farmers, are shown around or explore the area themselves, make photos, taste the products etc.. This has to be made into a great experience for both, because there is no pay. Instead, the motivation of food testers would be (for example) to explore the local culture and economy while on vacation near or far, to get out into nature, and / or the slightly OCD-style behavior of mapping and systematizing the world, as also found at OpenStreetMap mappers and Wikipedians. Farmers on the other hand profit from the free tests and reviews, in contrast to the expensive centralized certification schemes discussed above. Also, they will often be able to sell their products to the food testers (if they like them of course). Enter the evaluation. Food testers now enter their gradings at the online platform, partially into a form and partially as a freeform text. This may be anonymously or optionally anonymously to allow them to be honest. Mutual grading (optional). Food testers may also grade each other, probably anonymously, and farmers may grade the competency of food testers. A clever network analysis algorithm would then determine a weight factor for the gradings of each food tester, differentiating their votes by importance. Algorithm calculates the result. From all this input, the online platform generates a grading for the different products of a farmer. That grading can be a single percentage number indicating “sustainability” (as we proposed already). Or it could be four percentage numbers for four broad categories (health, environmental effects, social issues and fairness, animal welfare), similar to what was proposed by scientists in Germany for a combined “meta label” for food. Display offline and online. The grading results are displayed on a label on the food packaging, and of course on the online platform (which usually will also offer the farmers products for sale there). The online platform will also contain all the details for everyone who is interested (full review tests, splitting by subcategories, and all the individual gradings by food testers). People can use a QR code printed on product packaging to navigate from the product label to the online platform where they can confirm the grading claimed on the product package. The label on products with its QR code could look like this proposal. Customize your own grading algorithm (optional). Visitors might even be provided with a feature to select their own grading criterias and food testers and their relative importances, resulting in customized gradings based on the stored data. These gradings can be displayed in realtime using while shopping online, and even when shopping offline by using an app that can scan product barcodes. We intend to pilot this scheme with coffee from Nepal that is exported to Europe. More on this in this article.